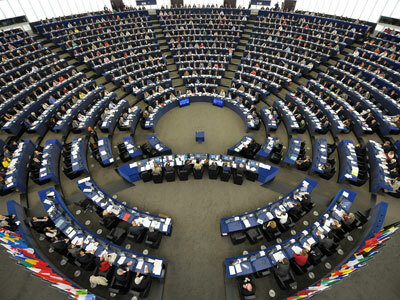 ACTA supporters made a last-ditch attempt to save the controversial legislation in the last debate before it goes to a vote at European Parliament – by arguing the vote should be postponed. Meanwhile, most MEPs lambasted the proposed copyright law. ­“ACTA is over. This farce is over,” proclaimed Niccolo Rinaldi from the Liberal ALDE party. “ACTA is dead and now we are going to define what copyright should be,” chimed in left-winger Helmut Scholz. Even hardline right-winger Marine le Pen joined a broad coalition that should secure the demise of the unpopular law in Wednesday’s vote. Beleaguered and divided, the Center-Right European People’s Party (EPP), who had previously spoken in favor of ACTA (the Anti-Counterfeiting Trade Agreement) now pleaded for the European Court of Justice (ECJ) to be the final judge. “I think it would be irresponsible now to vote one way or another. 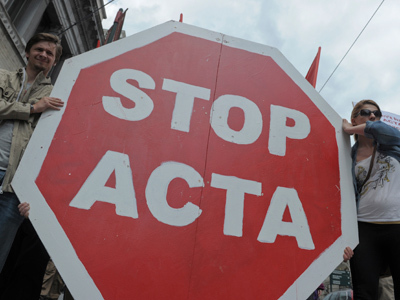 Why are those who oppose ACTA so afraid of the court?” asked Cristofer Fjelner, the EPP spokesman on ACTA. Its opponents claim the bill's supporters are resorting to delaying tactics. The ECJ – which is examining whether legislation contradicts other European laws – could take up to a year to reach a decision. 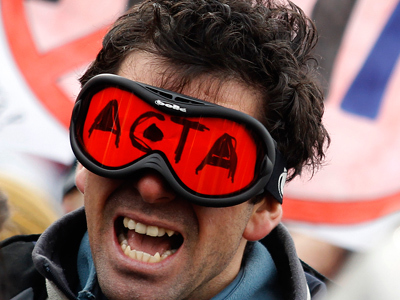 ACTA has already been rejected by all five of the European Parliament Committees, suffering a particularly resounding defeat with the Civil Liberties Committee. 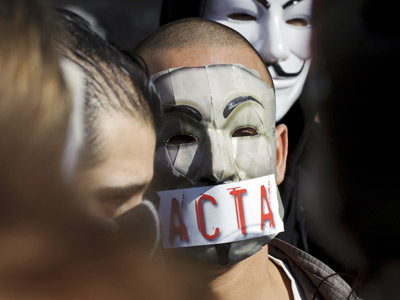 The specific legal implications of ACTA have not been finalized, but among other concerns opponents fear that it will infringe on privacy, introducing surveillance techniques that would radically curb the freedom of the Internet. “Imposing ACTA would mean that we would have the machinery – filters, content analyzers, monitors – that China has in order to control the Internet,” said Andrew Brons, a British National Party parliamentarian. Twenty-two of 27 EU members initially supported the legislation, but it has to be voted for by the European Parliament, then in each individual country, in order to come into force. During the final debate, many of the bill's proponents cited the losses suffered by those who manufacture intellectual property – music, film and design – only to see it taken for nothing due to information-sharing technologies. 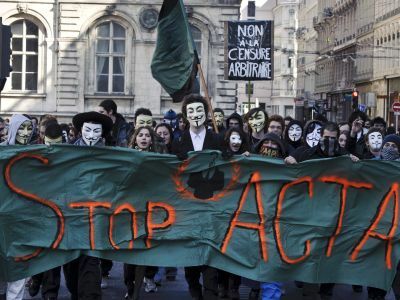 “ACTA is not an attack on our liberties, it is a defense of our livelihoods,” said Karel de Gucht, the chief of the European Commission for Trade, which initially submitted the legislation. 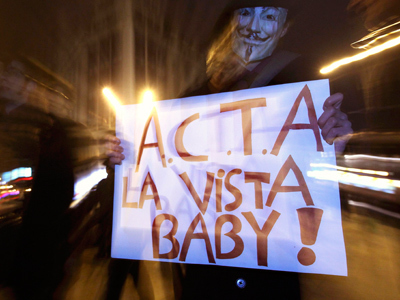 The opponents struck a more alarmed tone, and appealed to the unpopularity of ACTA among the public and advocates. Earlier in the year, thousands took to the streets to fight the legislation. Fifty-seven public Internet organizations also signed a petition lashing out at the law ahead of the vote. Rapporteur David Martin, who recommended that ACTA be rejected, did not deny that content-producers should be rewarded, but said people’s concerns deserve to be prioritized. Long-time anti-ACTA campaigner Jeremie Zimmermann predicted that a split EPP (not everyone in the EU parliament’s largest party was swayed by the delay tactics, or even supports ACTA) and a wide coalition of enemies of the legislation will likely ensure a handy defeat on Wednesday. 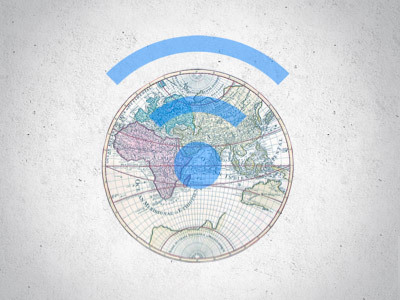 And even if ACTA is repelled, as technology advances, the “copyright wars” are anything but finished. “The fight is not over. Like monsters in a zombie film, the bad parts of the ACTA proposal will rear their head in other proposals for legislation,” summed up Carl Schlyter from the Greens.